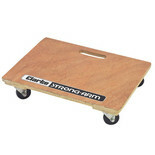 A general purpose dolly platform to enable the easy movement of heavy / awkward items over a relatively smooth floor surface. 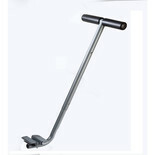 A useful item in virtually any buisness premises. 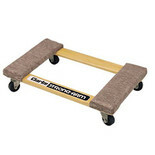 This traditional rolling platform provides a conveneint way of moving heavy or awkward items. 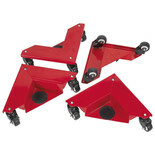 Suitable for retail, commercial or industrial use on virtually any reasonably level floor. 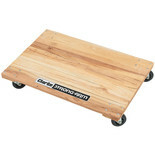 This traditional rolling platform provides a convenient way of moving awkward and heavy items. 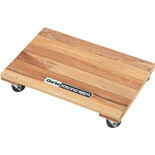 Suitable for retail, commercial or industrial use on virtually any reasonably level floor. Low cost trolley for moving bulky or heavy items in offices, shops, warehouses, etc. 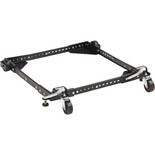 The Draper 3 wheel dolly is ideal for moving loads of up to 60kg. 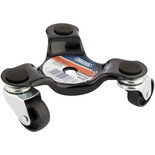 The stable aluminium base is cushioned, helping protect items while being transported to ensure they are moved safely and efficiently. 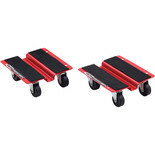 The Olympia Tools Transport Dolly provides an easy and convenient way of transporting heavy and bulky items on site, in the office or at home. 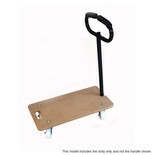 Universal handle for a wide range of handleless dollys.